August seems to find me busier offline than ever. Which means my blogging energy is on the wane. Don't worry! I am not about to give it up! I just am finding it tough with not enough natural light in a cold dark winter in the first year that it is really mattering to me since I started blogging. I have borrowed a light box from my brother but need to find time to work out how to use it. I am still trying to sort out the space issues with photos on my computer, as well as being kept busy with a whole host of other activities. Including recipe testing which is taking some of my blogging energy. Then there are the recipes that just aren't ready for a full post! Like the apple pie that needs further work. Let me start this month's peek into my kitchen with a taster of my recipe testing. I was so excited that one of the recipes for the cookbook by Leigh Drew that I got to test was a batch of vegan cheeseymite scrolls. They were so good. Sylvia ate one when it was warm and then refused to eat them once cooled on the grounds that they were "too vegany". I was so in love with them I could have cried when they were all gone. 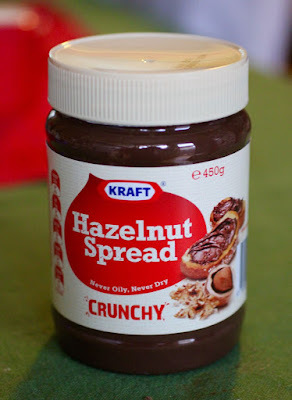 I was intrigued at a Kraft version of Nutella. We all loved it. E thought it superior to Nutella. I found that it could be eaten from the spoon. Sylvia was impressed at adding it to a smoothie. Recipe testing has had me looking out all sorts of equipment I don't usually use. I have purchased a new frypan that can go from stovetop to oven. However I didn't buy pie tins because I have this motley assortment of pin tins from my late maternal grandmother. I photographed them with a 20cm cake tin beside them to show just how little and cute they are. Lime spiders are a Christmas tradition in my family. 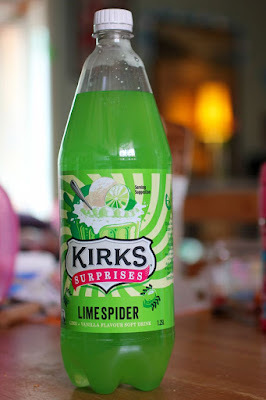 So when I saw this lime spider soft drink sentimentality gave way to pester power and I bought it for Sylvia to share with her friends at our Christmas in July lunch. 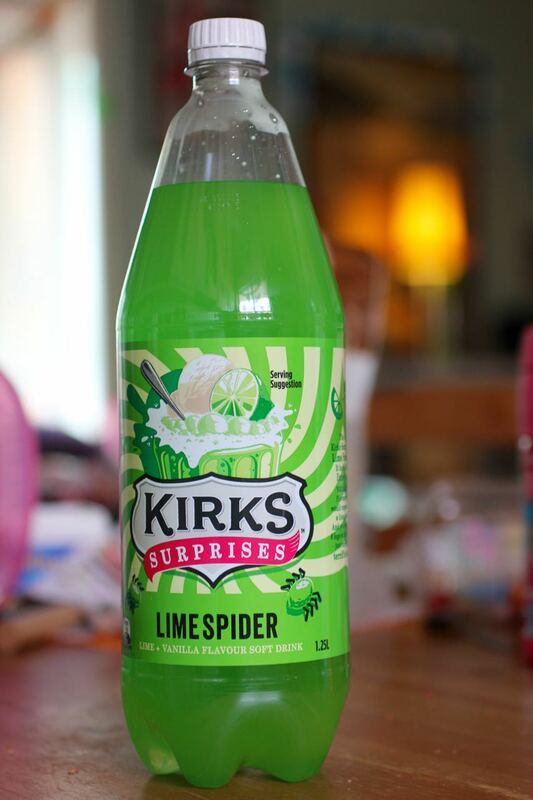 I had a small taste and it was just sweet lemonade without any of the fun or fizz of a spider. Another disappointment in the kitchen was this vegetarian jelly. I am not a huge fan of jelly but Sylvia loves it. So during a kitchen clear out I found this packet that was best by 2010. I mixed it up and it never set properly. Unfortunately because it was so many years out of date I am not sure if that was the problem and I wonder if I should buy more to check. Sylvia loved eating the swampy jelly and would be happy to test taste! Not all has been awry in my kitchen. This packet of Sakata Roast Tomato and Balsamic rice crackers was bought on the recommendation of Kari in her July In My Kitchen post. We consume a lot of rice crackers here, mostly seaweed. Kari said that these are her favourite so I wanted to try them. Sylvia and I were most impressed. They are part salt and vinegar and part bbq and 100% delicious. 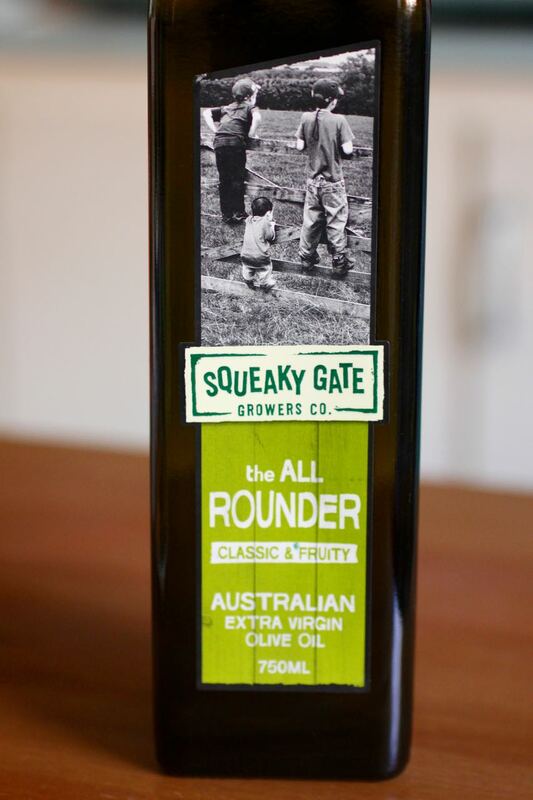 I am not a connoisseur of olive oil. I love the stuff but don't use a lot in recipes. However I do love to support a local company. So while I was entertained by the label on this bottle, the clincher was that the company's address was close to where I live. Then I was disappointed to read their website and find it full of marketing guff without any real information about the company. I am yet to open the bottle so I can't tell you much more about the actual oil but it does have a cute photo on the label! A few weeks ago I had a friend of Sylvia's over and made this tart while they played. It was a triumph of leftovers. Pastry that was clogging the freezer, the remainder of a vegan cheese sauce, some cherry tomatoes on the turn, and some leftover sun dried tomato butter. I fried the tomatoes in the butter til soft and most of the liquid was absorbed and baked them on the cheese and pastry. It was delicious and was a good snack for the kids. I think Sylvia preferred the crusts! It is the time of year when fresh fruit is not at its best (though I bought 3 punnets of strawberries for $6 today) so we have been having lots of smoothies. I really enjoyed this peach nectar in a smoothie with banana, orange, strawberries, passionfruit and soy milk. On the weekend I made overnight sourdough bread but it was too cold for it to rise enough to be ready to bake by lunchtime. Instead I bought some zaatar pizzas from Zaatar on the way home and filled mine with hummus and vegies. E had Sriracha on his which is his new favourite hot sauce. The price of the pizzas has risen from $1 to $1.30 but it still makes for a cheap and delicious lunch. Finally I want to reflect on our meal on Saturday night. I thought I would make something simple for the main course so I could make apple pie. It still took me from 4.30 to 7.30 to make dinner. To be fair, I did spend time speaking to my mum on the phone, getting Sylvia's dinner, breaking the sugar container, and generally organising other things around the house while I made dinner. There is no such thing as making dinner with no distractions at my house. Above is a capsicum that I chargrilled over the gas flame because it seemed quicker than roasting it. I was following a recipe from Ottolenghi for Marinated peppers with pecorino. I wasn't too impressed with this dish because the marinade was too garlicky. However I changed so much - chargrilling, no watercress, less cheese and less herbs - that I don't hold Ottolenghi responsible. I still have some marinated peppers to use in another dish. I had some shortcrust pastry in the freezer so I decided a pie would be easy as stewing them is pretty straight forward. However chopping up the apples took quite a while. I stewed up about 8 granny smith apples (give or take what Sylvia could swipe from the chopping board) with 1/4 cup castor sugar, 1 tbsp brown sugar, a shake of cinnamon and juice of half a lemon. I cooked them until mostly soft and they then cooked to a lovely soft filling in the pie, though I wondered if they should have had held their shape. I had decided to serve the marinated peppers with fresh bread, brussels sprouts and tofu besan omelet. The omelet was meant to be a matter of quickly whizzing up ingredients but as I used a firm tofu instead of a soft one, I found myself having to add lots of milk to reach the right creamy consistency. Then there was more mixture than usual and it stuck to the bottom of the frypan. Usually my omelet slides out like a golden disc but this one was a mess on the plate. It still tasted lovely and the leftovers were eaten in a sandwich and then on mee goreng. In hindsight scrambled besan would have been quicker. I had asked E to buy ice cream for the pie because I knew he and Sylvia would like this. He was in a rush and bought chocolate orange ice cream. It wasn't what I would have chosen but they enjoyed it. I am sending this post to Celia at Fig Jam and Lime Cordial for her In My Kitchen event. Head over to join in (by 10th of each month) and/or check out what is happening in other bloggers' kitchens. Celia usually has the links to other In My Kitchen posts on her side bar but she has some other pressing issues this month and has asked us to scroll down the comments to find links. I love those old pie tins from your grandmother- beautiful aged willow tins are great all mismatched with pies in them. Sorry to hear that your blog enthusiasm has been waning. Another friend wrote about it too. Those pie tins are absolutely gorgeous Johanna! Besides the grandmother's gorgeous old pie tins what I love is that we see the lovely food you've been making and eating, for real! I love the old tins! Looking at your photo, I also have those little patty tins(?) but gave them to my sister. I've had the jelly before and I think it did set well though. I'll be making another batch soon for an upcoming kids party. I wonder if that kraft spread will help people during this 'Nutella shortage'! Thanks Shaheen - you probably did best to throw out the jelly. I think once the recipe testing is over and I have a bit more light for photos my blogging energy should rise though generally time seems in short supply. Am curious about your marmite recipe. I seriously adore your pie tin collection. And don't you love a baking project that does double duty - feeds you and unclogs the freezer at the same time. The tart look scrumptious. Thanks Milk and Honey - the freezer seems to do double duty while recipe testing but am getting through most of it - though had to throw out one unidentified tub of food. Johanna, light makes such a huge difference and I do hope you get that light box hooked up and it works for you. It's no fun feeling "off." Your mini pie tins are adorable and sentimental, and your "triumph of leftovers" pizza looks delish! I also got a kick out of your "swampy jelly" description. :) Wishing you a distraction free dinner zone soon -- and more light! Take care. Thanks Kim - will try and get the light box hooked up but not much space for it, The tart was great - and I still have more pastry to use up so maybe more tarts in my future! The comment about the "too vegany" made me chuckle! 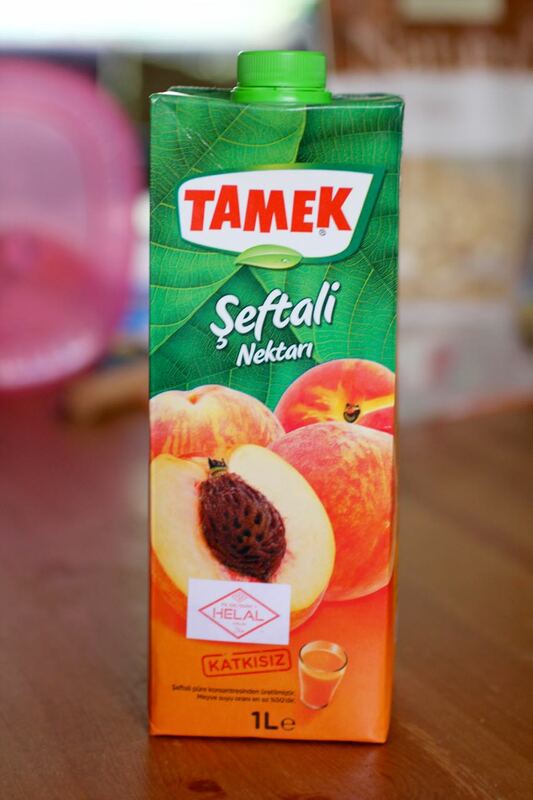 What was it that tasted too vegany? I love Vegemite/Marmite - it's been so long since I've cooked with it, it's criminal. The vegan cheese tart looks phenomenal too. Thanks Lorna - I don't think I see those jelly crystals often and can't remember where I bought them but I know sylvia would love me to make it regularly. Good to hear they work for you. Thanks Charlie - sometimes when it is so dark in the house I do feel like I need more sunlight in my life at this time of year - even when we get sunlight it is only for a few hours and is over soon. Those pie tins are just darling, don't you ever get rid of them!!! Or at least I'll give you my address and I'll pay you for them!!! :) The whole light thing has done my head in too...I don't like cooking dinner at 12 noon just to take a photo!! We all understand and still love seeing what's happening....now, pass me a slice of that apple pie would you lovely? Thanks Kyra - great save with the jelly crystals - I did wonder if some agar or vegie gelling agent would help - next time I have out of date jelly crystals I will be sure to remember - I don't think our coles still have them but maybe will check again. I am so glad you liked the rice crackers! Feel free to eat my share too now they're less accessible for me :D I relate to life seeming busy at the moment but am always glad to peak into your activities and kitchen. I've experimented with char grilled capsicum on the stove top but am often too lazy to char grill. I think all of us can also struggle to find the energy to make pastry from scratch but sometimes it is so much better! Chocolate orange ice cream does sound like an interesting accompaniment. Thanks Kari - it is nice to have another flavour of crackers to look out for. I never make puff pastry from scratch but I think my experience of buying it was not great - leftover scraps of home made shortcrust are so much easier to work with than the leftovers of the shop bought one. I was a little surprised that the chocolate orange ice cream was eaten so quickly and I never even got a small mouthful - how can one man and one small child eat so much so quickly! I've got a bunch of those jellies in my cupboard - I should use them! I have used them before and they have set fine - sometimes i put a little less water than recommended and that seems to do the trick. Thanks Caeli - good to hear they work ok - I think I might try them with a bit less water next time - though it is one of those tricky recipes where you don't get an opportunity to amend once it is set - but I would like to try some that aren't so out of date as a few people have had success with them. Thanks for the fun look in your kitchen. I live the pie tins. 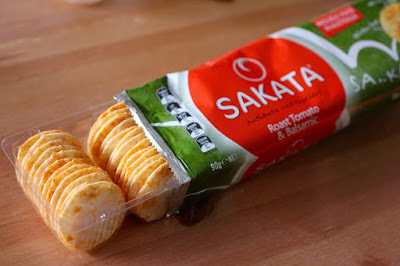 My fave rice crackers are Sakata wholegrain. Also, I have never had much success with vegetarian jelly. I too would love to know if it was the crystals or if that is just another brand to avoid. I love meals that use up leftovers, and some of my best creations have resulted from hunt and gather sessions in the kitchen. I feel your pain about sourdough - my bread has been very picky lately due to the cold so I'm having to allow lots of extra time for baking. It's making my hours very odd as I always forget to allow for the cold so I'm up kneading and baking in the dark quite often. Bring on Summer! Thanks Lisa - according to the other comments the jelly works better when not years out of date so I will try it again if I can find some. I find sourdough interesting how in summer it grows at some rate and then is so sluggish in winter which can suit me sometimes but I do love to make it for lunch on weekends when we have time to enjoy a nice sandwich made with fresh bread. Everything tastes better on fresh bread - esp nutella! Sometimes things just get so busy don't they and it is really hard finding the time to do blogging justice..... But you have done a great job with this post! Whilst I have never heard of a lime spider, we do eat Sakata rice crackers regularly in our house and we love them. Soured cream ones are pretty good too! Interesting way to cook a pepper!!! !